A flawless facsimile—accurate to the color of the medieval gold ink. Completed circa 1474, Sébastien Mamerot's lavishly illustrated manuscript is the only contemporary document to capture four centuries of French crusades, when successive kings tried to capture the Holy Land. Jean Colombe, the medieval illuminator best known for his work on the Très Riches Heures du Duc de Berry, is the principal artist of its 66 exquisite miniatures. Mamerot's manuscript was dedicated to his patron Louis de Laval, governor of Champagne, whose inspiration was the Christian equivalent of extremist jihad—a xenophobic holy war with its origins in a Papal appeal by Urban II. Les Passages d'Outremer (The Expeditions to Outremer) comprises 277 parchment folios, illustrated by Colombe and the finest caligraphers of the medieval era, and now resides in the French national library. This unique manuscript is the source of TASCHEN's facsimile reprint, which is accurate down to the color of the medieval gold ink. 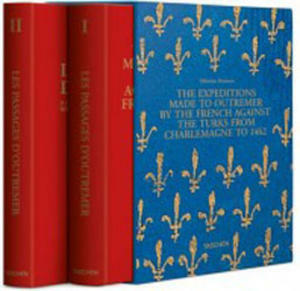 Our lavish two-volume hardcover edition, presented in its own slipcase – consisting of a facsimile volume and a commentary volume containing a comprehensive translation of the manuscript text and explanations of Jean Colombe’s miniatures – is a rich testament to this long, glorious and bloody period of history. Battles, funerals, religious ceremonies, coronations, and royal processions, in a series of illuminations tracing centuries of merciless war, helps explain how we got where we are today. The copy belongs to the Bibliothèque nationale de France, Paris.